During the composition of »Strophes« (2003), in which the architectonic features of a high-tech factory influenced various parameters of the work such as the production of sounds, Marios Joannou Elia developed the concept of polymediality. This involved two dimensions: the work-immanent compositional dimension and polymediality in the process of staging. The prefix poly denotes a qualitative paradigm shift; not a quantitative much, but a qualitative, polyaesthetic more. Written between 2007 and 2010 as a commentary focused on his opera »Die Jagd« (2008) and the orchestral piece »Akanthai« (2009), this book illuminates Elia’s concept of polymediality and, by providing a wealth of examples, how literary sources become an inherent polymedial element of his music. 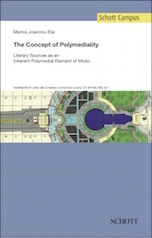 At the same time, the commentary elucidates a series of fundamental aspects of the music, including the model of imitative interaction, the concept of permanent fleetingness, the concept of polyaesthestics, and the question of musico-literary intermediality. Zitation · Elia, Marios Joannou: The Concept of Polymediality. Literary Sources as an Inherent Polymedial Element of Music, Mainz 2017 [Schott Campus, urn:nbn:de:101:1-201707066904].